Betcha thought we forgot about In Nomine, huh? 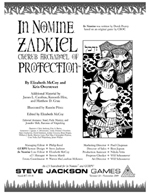 It hasn't been an easy trip for poor In Nomine Superiors: Zadkiel. Fans have been waiting for her for quite some time now. The Archangel of Protection is not one to be denied, however. So now that the book is available for purchase by our eager (and very, very, very patient ) fans, just what's inside? Oh, just every little thing you could want to know about Zadkiel. Her likes, her dislikes. Her hobbies. Her friends. Her enemies. There might even be a little Canon Doubt and Uncertainty, if you're lucky. But enough of my silly ramblings. This fine book has been delayed long enough, I think.